Stefano and I are going to be visiting Brussels during the Easter holiday, so today I decided to write a pre-Brussels post in order to ask my Belgian readers (or readers who have been there) for some tips on where to go, what to see, the best places to get a decent meal (Belgian food), etc. We’ll be there for four days, btw. Can’t wait!!! As for eateries, well, it’s no secret that I’m a chocolate lover, so there couldn’t be a better place for me than the land of Belgian chocolates. 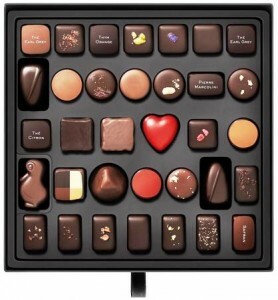 😉 We will definitely make a stop at one of Pierre Marcolini’s “haute chocolaterie” shops (see photo of his selection box), highly recommended by a chocolate-loving friend of ours. I hope we can afford his prices, though! I am also curious to visit “Mary,” the shop that supplies pralines to the Belgian royal family. And, since Stefano likes a good glass of beer, I was thinking of taking him to the Cantillon Brewery, unless someone has a better suggestion…Of course, we will be eating regular food, too, so suggestions to that regard are most appreciated, too! 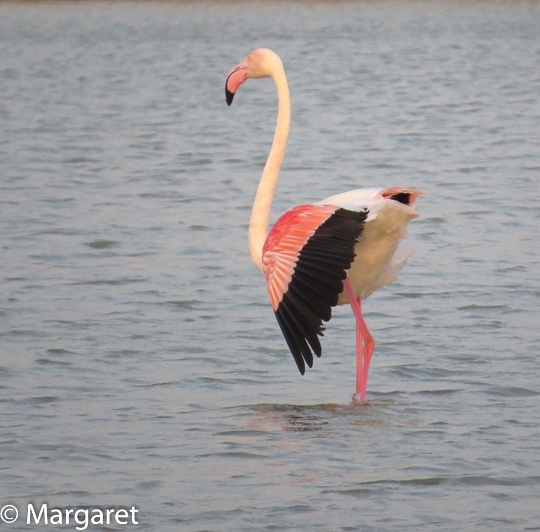 Yesterday, as soon as we found out that a flock of flamingos had landed in our favorite bird reserve, Stefano and I got our gear together and rushed over there. We arrived about an hour before sunset, so the light wasn’t great, as you can see. 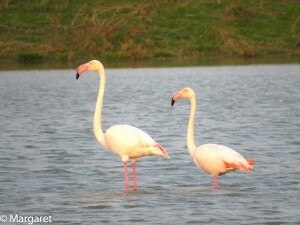 Plus the flamingos were on the other side of the lake, so please don’t look too closely at my photos. They’re terrible! But they do document the presence, for the FIRST time ever!! 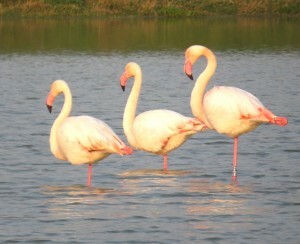 !, of 15 flamingos in this bird reserve. It’s a historic event! Amazingly exciting. 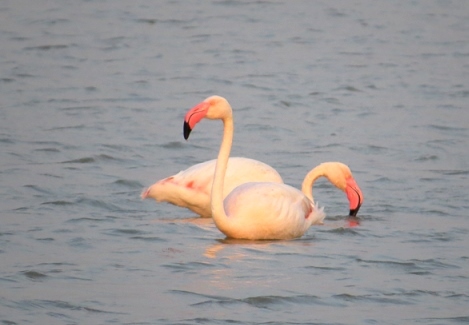 I hope these interesting birds are going to enjoy the reserve and stick around for a few days, which would give us a few more opportunities to photograph them, perhaps under better conditions…But even if they fly away today, it won’t matter to me: I’m so thrilled to have seen them here in Florence (after seeing hundreds of them in Camargue, years ago). Well, duuuuh, we already knew that, but this–that is, the fact that curcumin is a safe and promising treatment for most cancers–is the conclusion reached by a group of scientists who reviewed past clinical trials. So…hey…it’s official!!! But that isn’t the only reason I haven’t been devoting my free time to research and blogging. We’ve just come out of a terrible period of worry and fear that began on January 20, when our eldest male cat, Piccolo, 11.5 years old, became suddenly and seriously ill.
Luckily for us, it turned out that his kidney failure wasn’t chronic but had been caused by an anti-inflammatory drug OVERDOSE (= a dose, mind you, that had been prescribed by our own family vet…well, now our former family vet…). I mean, Piccolo almost died because of a stupid limp (which, by the way, is gone now). Crazy. Absolutely crazy. 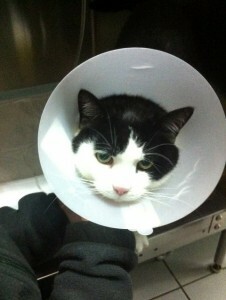 But the main thing is that Piccolo is okay now, thanks to the wonderful loving care he received at the clinic. He still hasn’t recovered 100%, but he’s back to his normal self, and his creatinine is almost back in the normal range now. We hope to get there next week, after finishing the I.V. therapy he’s been doing as an outpatient for weeks now. Piccolo is an extraordinary cat. He is the only one who “skypes” with my parents, responding to their voices and gestures. 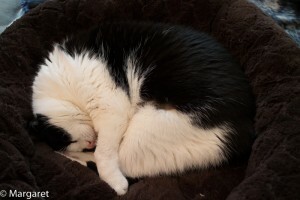 And, like he did when he was a young cat, he still fills our bed with balls during the night. He won’t run down the stairs to retrieve them anymore, but he still brings them upstairs for us to throw (and for us to retrieve, too…!). 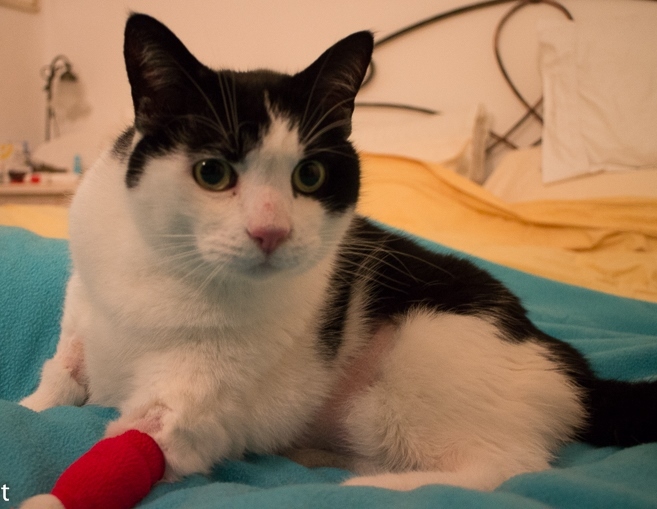 He is very affectionate, loves giving forehead-to-forehead love bumps, and yes, he’s a chatterbox…he always has lots to tell us, especially when we’re driving to the animal clinic for his treatments (meowmeowmeow…aaaagh!). We love him to bits. And to think that, if I hadn’t had that gut feeling, we would have lost him…Scary. Bottom line: every time I’ve followed my gut instinct, I’ve made the right choices. So here is my advice for today: always listen to your…gut!